TO many people a railway timetable is at once dull and incomprehensible. Even to the railway enthusiast it has not a universal appeal. But to those who are interested in details of railway working it possesses a fascination all its own. So much so that a document intended to be a means to an end - a source of information about the train services - may become in the eyes of the collector an end in itself. Old time-tables originally published at a penny are now worth anything from half a crown to ten shillings each. Exceptionally rare specimens fetch even higher prices. In the infancy of the railways the passenger train services were announced on the station bills and in the local papers, as the companies had not yet thought of issuing their own time-tables. There survives, however, a time-sheet of the Euston-Tring section of the London and Birmingham Railway, showing the “Hours of Departure, commencing 29th October, 1837”; and, as early as May, 1839, the Great Western Railway published a time-bill of train services between Paddington and Maidenhead. The latter is an interesting document. The first announcement is that of the opening of “the Southall Station”. 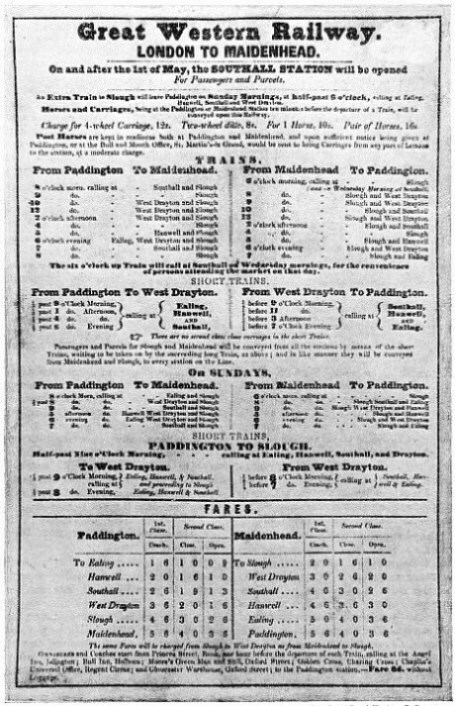 Trains were advertised to run from Paddington at the even hour to Maidenhead, between 8 am and 8 pm, but there were no services at eleven, one, or three o’clock. Four “short trains” left for West Drayton. On Sundays, in addition to six Maidenhead trains, one “short train” ran to Slough and two to West Drayton. The fare table shows that there were three classes: First (coach), second (close), and second (open), but no third. The first Bradshaw is said to have been published in October, 1839, though there exists evidence suggesting publication a year earlier. Bradshaw’s Guide was a collation of all the time-tables in the country. The passenger intending to travel extensively could thus find out all about the train services from one book, instead of having to arm himself with half a dozen time-tables issued by the different companies. NOTABLE PLACES along the route are illustrated on the cover of the North Eastern Railway’s time-table for November, 1891. Beginning with the bottom centre picture, and reading clockwise, are seen: York, Berwick. Fountains Abbey, Whitby, Barnard Castle. Hull, Knaresborough, South Shields, Edinburgh, Forth Bridge, Harrogate, Newcastle, Durham, Scarborough, Flamborough Cliff and York Minster. The price of this time-table was one penny. But even Bradshaw did not solve the problem for some travellers. While there are and always have been individuals who revel in the intricacies of the various tables, some people profess themselves totally unable to understand them. Some, indeed, boast of their lack of comprehension. For such the A.B.C. was devised, the first issue appearing in 1853. This form of railway guide takes London as the centre, and gives the railway stations in alphabetical order, with fares from London, and a summary of all the trains from and to London by the various direct routes. Every place is treated in this manner, except that stations too unimportant to deserve summaries of their own are cross-referred to others. Such a guide is not only alphabetical in its arrangement, but it is also claimed to be “as easy as A B C”. Similar railway guides are to be obtained in most large and many smaller towns. Some of them combine the alphabetical arrangement with a set of time-tables of the conventional kind, as exemplified in Bradshaw. The latest form of station time-table is the “Mechanical Information”. This machine has a keyboard and an illuminated window. The intending passenger selects his destination from a numbered list of stations, and presses the appropriate key, when the desired time-sheet appears in the window. When there were dozens of railway companies, each of them issuing its own timetable, the collector of railway literature was able to garner a rich harvest. Since 1923, when the Railways Act reduced the number of main line companies to four, the timetables were reduced in number accordingly. The LMS, LNER, Great Western Railway, and Southern Railway each publish at intervals during the year a weighty volume detailing the relevant train services. There are always a “summer” and a “winter” time-table, the word “summer” meaning in this connexion a period of ten weeks or so in July, August, and September, and “winter” the rest of the year. Some railway’s issue “spring” time-tables as well, dating from about May 1. The time-tables of the LMS, LNER, and Great Western Railway each measure about 11½ by 7½ inches. The Southern time-table is a reprint of the relevant section of Bradshaw, suitably enlarged with pages referring to its own activities. Its size is 6½ in by 5 in. The LMS book is the bulkiest, as befits the largest railway, running to 592 pages more or less. The LNER requires 426 and the Great Western 268 pages. The covers are severely plain, and directly or by suggestion reflect the colours of the passenger carriages belonging to the respective companies. Thus, the LMS cover is mainly red, the LNER cover mainly orange, suggesting the varnished teak of the LNER carriages; the Great Western cover is “cold tea and cream”, and the Southern cover mainly green. All the four time-tables are equipped with excellent maps of the systems concerned. Each is priced at sixpence. IN MAY, 1839, as indicated in this early Great Western Railway time-bill, frequent trains ran between Paddington and Maidenhead, Berks, twenty-four and a quarter miles from London. The fares were higher than they are now, the present day single fares from Paddington to Maidenhead being 5s 2d first-class, and 3s 1d third-class. Second-class, whether “close” or “open”, no longer exists on the Great Western, having been abolished on that line in 1905-10. In addition the LMS and LNER issue suburban time-tables, naturally of much smaller dimensions. There are also the time-tables of the London Passenger Transport Board, embracing the former Metropolitan, Metropolitan District, and London Electric Railways. But these time-tables include also the motor-bus, coach, and tramway undertakings included in London Transport. The few surviving small railways usually issue their own time-sheets. The modern public time-table differs in many ways from its predecessor. The time-table of thirty or forty years ago was published more frequently. For many years, for example, the London and North Western Railway issued one every month. The usual price was one penny, though some timetables were marked “gratuitous”, for distribution to certain favoured organizations. 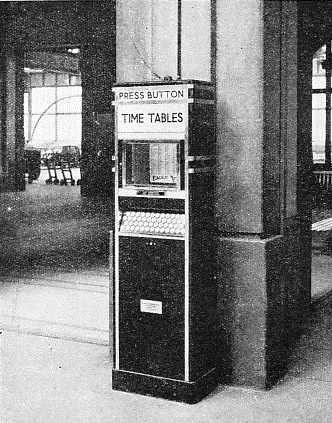 A penny time-table of a pre-grouping railway was not, however, as good value for money as a sixpenny post-grouping time-table, since a railway of the size of the LMS has absorbed far more than six railways. Further, the covers of some of the old time-tables were works of art. The Great Western time-table for July, August, and September, 1889, is a fine example of the style of the period. In the centre is an engraving of Windsor, flanked by views of Cardiff on the left and of Salisbury on the right. Above Windsor Castle is a glimpse of Plymouth, with Gloucester and Worcester cathedrals on either side. Below are Tintern (Mon.) and Llangollen (Denbighshire), supporting a view of Mumbles Lighthouse, South Wales. The colour scheme is brown, black, and white, which is much more pleasing than might be expected. In this connexion it may be noted that the Great Western is the only pre-grouping railway to retain its identity. 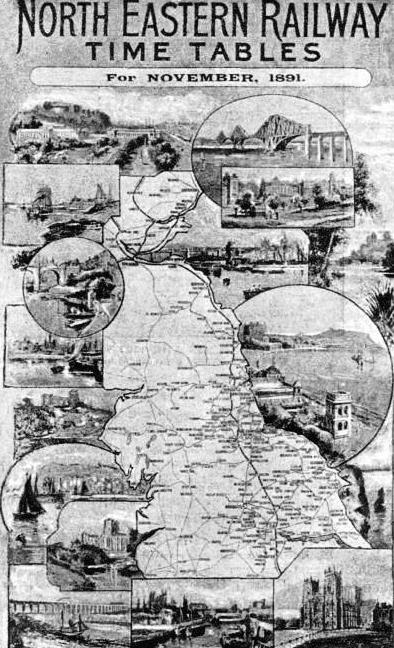 The North Eastern time-table for November, 1891, in black and white, shows a map of the system surrounded by views of Edinburgh, South Shields, Knaresborough, Hull, Barnard Castle, Whitby, Fountains Abbey, and Berwick on the left, and of the Forth Bridge, Harrogate, Newcastle, Durham, Scarborough, Flamborough Cliff, and York Minster (adjoined by York) on the right. The inclusion of Edinburgh and the Forth Bridge - the latter then only eighteen months old - must be regarded as an example of intelligent anticipation rather than as a presentation of the facts, since, though they were on the East Coast route, of which the North Eastern was an active partner, they were within the domain of the North British Railway. The London and North Western time-table for April, 1900, introduced scarlet and blue-green into the general scheme of black and white. The railway lines on the map, the “Railways in Connection”, and the background of “London and North Western Railway” are scarlet. The sea in the map is blue-green. Of particular interest is the scroll showing the fastest times of that period between London and Manchester, Liverpool, Birmingham, Dublin, Edinburgh, Glasgow, Aberdeen, and Inverness. This type of London and North Western time-table is probably the most attractive ever issued by the “premier railway”. A few years before the war of 1914-18 the London and North Western, following the lead of the Midland, which introduced a severely plain red cover in the style popular to-day, brought out an imitation in chocolate and white. TIME-TABLE SIMPLIFICATION is the aim of the “Mechanical Informator”. This is a cabinet with an illuminated window and a set of keys numbered to correspond with a list of stations. The intending traveller presses the appropriate button, when a card appears in the window showing the departure and arrival times. The South Eastern and Chatham time-table for “October, 1911, and until further notice”, is a successful effort in many colours. The cross-Channel steamer in the top left corner and the express train at the bottom are particularly attractive. 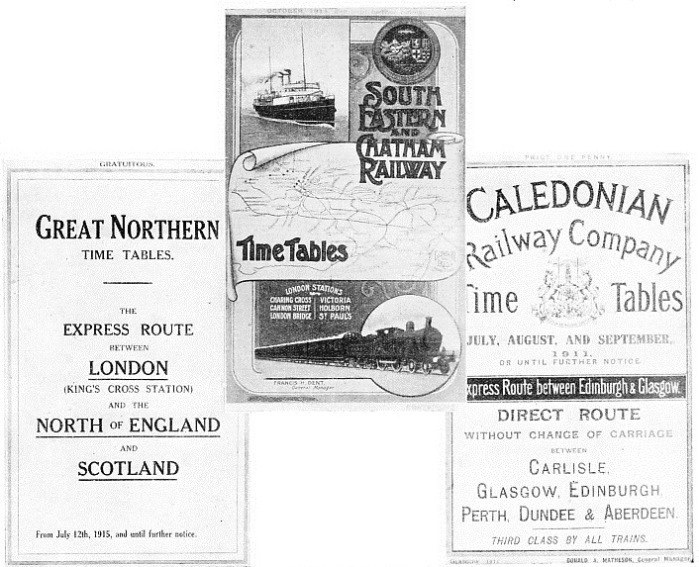 A contrast is provided by the plain Caledonian time-table for July, August, and September, 1911. Here the background is white, and the lettering dark blue, the colour of the Caledonian locomotives. The only ornament is the coat of arms in the centre. Still plainer is the rare war-time time-table of the Great Northern Railway “from July 12th, 1915, and until further notice”. This has a buff cover and brown lettering. As the war progressed, the railways gradually gave up issuing public time-books, though small folders were to be had. The train services gradually deteriorated as the war years went on, reaching their nadir in 1918. From that date a gradual recovery set in. To-day the train services are, with few exceptions, far better than they were before the war. The standardized time-table has long been the aim of the operating department. In some instances this aim has been realized. Years before the war the three main routes between Liverpool and Manchester all had express services operated at standard schedules and at fairly regular intervals. This regularity is now considerably impaired by force of circumstances. Some years ago the Great Western arranged to run its Paddington-Birmingham expresses at ten minutes, its Exeter and Plymouth expresses at thirty minutes, and its South Wales expresses at fifty-five minutes past the hour. Again circumstances have partly upset the arrangement. The latest example of standardized services is provided by the Southern Railway time-table of the London-Brighton and London-Eastbourne electric train services. Expresses for Brighton leave Victoria at the hour every hour from 9 am to midnight, and other trains leave at stated intervals throughout the day. The Eastbourne expresses leave at forty-five minutes past the hour. So regular is the service that the Southern Railway is able to announce that “time-tables are unnecessary”. Suburban services are usually arranged to run at intervals of so many minutes. But so far we have been looking at only one side of the picture. The public is familiar with the public time-table. The railways depend on something far more comprehensive - the “service” or working time-table. This is a book or set of books of formidable length and size. For example, a volume of some 130 pages is needed for details of the passenger service on the London-Crewe and Stafford-Birmingham-Rugby sections of the LMS, while the working time-table for the suburban lines of the Great Eastern section alone of the LNER runs to close on three hundred pages. The bound copy of the Great Western working time-tables, covering all sections of that railway, is a mighty tome of all but 2,500 pages, comprising fifteen different sections, and five inches thick. The size of these volumes is explained when it is understood that the service books deal with every form of traffic movement. This embraces passenger and goods trains, and those carrying milk, meat, fish, and other perishable foodstuffs. It includes also the working of empty rolling-stock between termini and car sheds, light engine working, shunting arrangements, stops for the purpose of changing engines or trainmen, stops for locomotives to take water, instructions as to whether trains are to run on the fast or slow line where an alternative “road” is available, and stops for the purpose of following other trains and for exchanging train staffs or tablets on single lines. Then there are the trains that run when required, on “conditional” timings, and the considerable number that either work only on one day of the week or that run on every weekday save one. Finally, there is, of course, the differentiation between the services from Monday to Friday and the Saturday and Sunday services. In a great many other ways the working time-tables differ from those issued to the public. Every train or engine movement is given a distinctive number, to which may be added a “reporting number”. This practice of identifying trains by their numbers is used also in America and on the Continent in the public time-tables for the purpose of identifying trains. Indications are given in working time-tables as to the place of origin and starting time of trains which have originated at stations outside the range of that particular time-table. The working time-table also indicates passing times at all the important junction points, and at certain other selected stations, of those trains, both passenger and freight, which are not booked to stop. These passing times are printed in small type so that they can be distinguished at a glance from the times of arrival and departure, or else the word “pass” is printed above the figures. Another indication not to be found in the public time-books concerns those trains of which the load is limited, to permit of higher speeds; this applies to many expresses on the LMS, which are marked “Limited Load” or “Special Limit” for this reason. Reference is made above to the indications regarding fast and slow line working. On a section of line having more than two running roads, the handling of traffic often requires, or is simplified by, the transfer of a train during part of its journey from the fast to the slow line, or vice versa. Such transfers are not confined to any particular class of traffic; they affect passenger trains booked to make frequent stops, trains of empty rolling-stock, fish trains, and others. The basis of a railway time-table of any description is a series of large diagrams upon which the paths of all the trains are plotted. The use of these diagrams shows at a glance the paths open to any train which it is proposed to introduce into the service, and the time limits within which it must run. Impossible paths are thus automatically ruled out. The graphic time-table of the rush-hour traffic of a crowded main line, such as that of the Southern Railway between London and Brighton, may give the uninitiated the appearance of alarming intricacy. It is, however, quite straightforward and intelligible. In general, the making of a timetable, whether on a small or a large and intricate railway system, is largely conditioned by the factors of track capacity, station lay-out, the number of and nature of junctions, the number of terminal stations, and whether train reversing at these terminals is by loops or cross-over roads. For instance, the Caledonian Section of the LMS has fifty termini to less than a thousand miles of route, a condition with an obvious hearing on the arrangement of the train services. Another factor to be studied in this connexion is that so many stations handle both a terminal and a through traffic, instances ranging from such busy long-distance traffic centres as Crewe and Carlisle to stations handling only short-distance passenger traffic, as Baker Street on the Metropolitan Extension, Mansion House on the Metropolitan-District, and Golder’s Green on the Hampstead Tube. Each volume of a working time-table represents a whole series of the most intricate jig-saw puzzles. Indeed, its intricacies and complexities are so many and varied that a layman, given his first glimpse of the service book, might be excused for wondering how it was ever possible to run a train at all. For so much has to be fitted in. The running of a single train may involve so many connexions, both at junctions on the system of the owning company and at junctions with “foreign” lines, that even a slight alteration in the timing of a single train may necessitate changes in the time-table on a section of line hundreds of miles away. 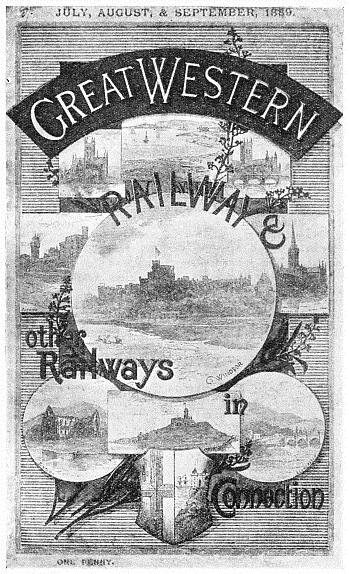 PLACES OF INTEREST are depicted on the cover of this Great Western Railway time-table for the summer of 1889. Windsor, with its castle, occupies pride of place in the centre, with Cardiff and Salisbury on either side. Above are Gloucester, Plymouth and Worcester; below, Tintern Abbey, Mumbles Lighthouse (near Swansea), and Llangollen, in Denbighshire. The Great Western Railway, alone of the great British railways, preserved its identity after the grouping of 1923. A typical section of suburban line is that on the LNER between Liverpool Street and Shenfield, via Stratford, Ilford, and Romford, a distance of twenty miles, over which some of the heaviest short-distance passenger traffic in the world is handled, in addition to express and other long-distance main line trains and goods traffic. The time-table is, in effect, three time-tables in one, since it embraces the services from Monday to Friday inclusive, the “Saturdays only” workings, and the Sunday service. Against each train leaving or arriving at Liverpool Street Station the number of the platform is indicated, and many of the trains have also appended to their timings a footnote regarding operating conditions. These notes are of every conceivable variety, such as “ex-Haydon Sq. to LMS line”, “a section for King’s Lynn will be attached in front”, “Ilford to attach empty milk tanks for North Elmham”, “to shunt at Brentwood for 1301, 1315, and 1316”, “ex-Mint St. (LMS) to U. Holloway”, “cars of 2.32 pm ex-Yarmouth”, “to run on T-line to Bow Junction, thence on Fenchurch line”, “calls at Cook’s Siding, due 6.29 pm”, “empties depart 7.5 pm for Temple Mills”, “to run on Goods Road from Stratford Western Jct.”, “until 30th September inclusive starts from No. 11 platform”, “runs 16th September only”. It will have been gathered from the above that although this particular time-table is officially only for “Suburban District (Section E)”, it is necessary to show all trains passing over the section. Thus, selecting a page at random, we find that the twenty trains of which it contains particulars are of the following description: express passenger, ordinary passenger, goods, goods Class “A”, LMS goods, Continental express passenger, and empty carriage train. Furthermore, this time-table deals only with one short section of a system with a route length of approximately 6,400 miles, and does not even embrace the whole of the London suburban services. T he working time-table is neither the sole nor the final authority, since it is reinforced by weekly and fortnightly notices, supplementary programmes of special trains, and notices dealing with exceptional traffic movements, such as those in connexion with a race meeting. The periodical traffic notices contain a host of special and miscellaneous instructions. These last range over the widest field imaginable. The staff is notified of such facts as that an insulated goods van, identified by its number, is required for special examination; that “the annual traffic in day-old chicks has again commenced to pass”, and that this traffic requires special treatment, which is described. Again “parcels traffic for Black Bull (N.S.) is being received at Congleton, but the correct station is Tunstall”; and “no deviation must be made from a strict shuttle service” in working the departmental letter-bag service. The platforms at a certain station have been shortened, and drivers “must pull trains up to the home signal”; on certain days water will not be available for locomotive purposes at a given station between certain hours, and only certain routes may be used by specific classes of locomotives “for breaking-in purposes until further information is received”. RED AND BLACK are the dominant colours of this London and North Western Railway time-table for April, 1900. 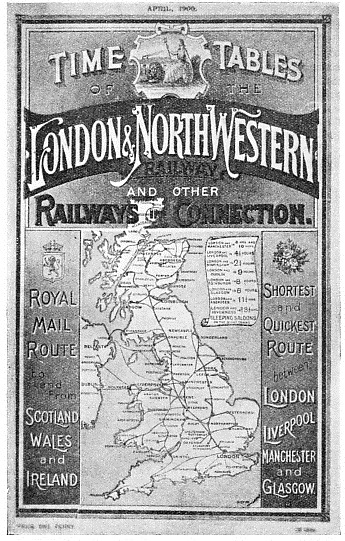 The London and North Western was the largest of the constituent companies forming the LMS in 1923. The scroll on the right of the map shows the fastest schedules in operation on the line in 1900. To-day Manchester and Liverpool are fifty-five minutes, Birmingham fifteen, and Edinburgh and Glasgow twenty minutes nearer London. Another fortnightly notice directs attention to engineering matters affecting the working of the trains. It orders, for example, temporary speed restrictions or wrong line working where track operations are in progress. This work is ceaseless, and a single fortnightly notice for one division of a railway alone may contain over a hundred separate announcements. The works in respect of which these announcements are issued include track relaying, which may either block a particular running road or set of roads or merely necessitate reduced speed; rearranging connexions; taking down disused signals; repairing point connexions; taking out points and crossings and substituting a plain road; track subsidences, in which event “drivers are to keep a sharp look out for hand signals”; widening, repairing, or reconstruction of over- and under- bridges; platform extensions or alterations; unloading special sleepers; road blocked save for special ballast train; installing track circuits; and tunnel repairs. Train alterations bulk largely in the fortnightly notice, and affect both the goods and the passenger department. New trains are booked to begin running; others are taken off; others again are booked to make extra stops, or to omit calling at certain stations, or are slightly varied as to running time. New light engine workings are arranged and others cancelled; empty goods trains are re-timed; and alterations are made in empty passenger workings. A few words of explanation may be necessary regarding the running of trains shown as “not advertised”. These are not indicated in the public time-books or other announcements, since they run only if warranted by traffic requirements. The full details of their timings are given in the working time-tables, so that all concerned are familiar with their itinerary when the trains are run “as required”. Such trains may therefore be regarded as occupying a category midway between that of the special and the one regularly booked. Trains “not advertised” are commoner than is generally realized. They exist even on the London underground railways, where the last trains shown in the service books serve the dual purpose of returning empties to the car depots and conveying the staff home. Reference should be made to another aspect of the time-table of which the general public knows nothing. This is the running of trains and light engines solely for the company's own purposes, and represents a heavy traffic in itself. To begin with, there is the working of coal trains between the collieries and the locomotive depots, for which purpose large numbers of wagons are reserved for the exclusive use of the locomotive department. This traffic, as with all the coal and coke business handled by the British railways, necessitates the working of one empty to each loaded train, since the vehicles are not used for general merchandise. Provision has also to be made for the running of ballast and other permanent way material trains, both those regularly booked and specials, and for the conveyance of gas-holder trucks to country stations where the railway company undertakes its own lighting. SEVERE SIMPLICITY is the keynote of the modern covers illustrated here. Each of the four great British railways has chosen a colour resembling or suggesting the colour of its passenger stock. Thus, the Southern cover is mainly green, the LMS cover mainly red, and the Great Western cover “cold tea and cream”. The varnished teak of the LNER carriages is suggested by the orange tint of its time-table. The Southern time-table measures 6½ in by 5 in. The three others are considerably larger, the size of each being 11½ in by 7½ in. THE LAND AND SEA ACTIVITIES of the former South Eastern and Chatham Railway are indicated in the centre picture, which shows the cover of the 1911-12 “winter” timetable of that system, now absorbed in the Southern Railway. On the left is a time-table of the Great Northern Railway, issued during the war of 1914-18. The 1911 summer service on the Caledonian Railway is contained in the book illustrated below. The Caledonian, one of the constituent companies of the LMS, operated the Scottish section of the West Coast Route.